The SE-C3500 is combining style with functionality. The SE-C3500 10-line LCD provides the operator a reference for the current transaction to eliminate errors. Up to five (5) items, the transaction subtotal and the price of last item entered are all displayed for the operator’s review. The SE-C3500 also boasts a 2X2 pop-up customer confirmation display with the last item’s name, price and the transaction subtotal. The SE-C3500’s large flat keyboard (72 key positions) make this machine a perfect fit for small quick service, concession and take-out operations. 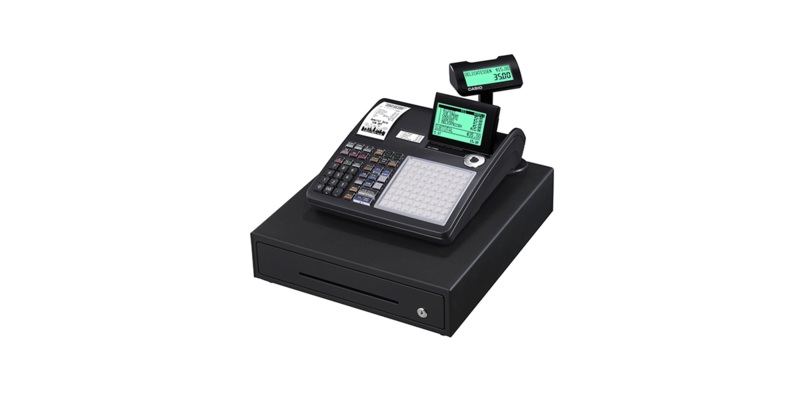 The flat keyboard will accommodate those items deemed fast movers or frequently sold items allowing operators to speed up transaction time. The large heavy duty cash drawer makes it a perfect fit for high demand operations. The SE-C3500’s two (2) station thermal printer provides receipt copies for customers and hard printed journal tape for the retailers records. Customer receipts can be customized with a graphic logo or programmable top and bottom messages along with the detailed item descriptors printing as well.